Learn what's in a class archive at class close and how to send one to students. 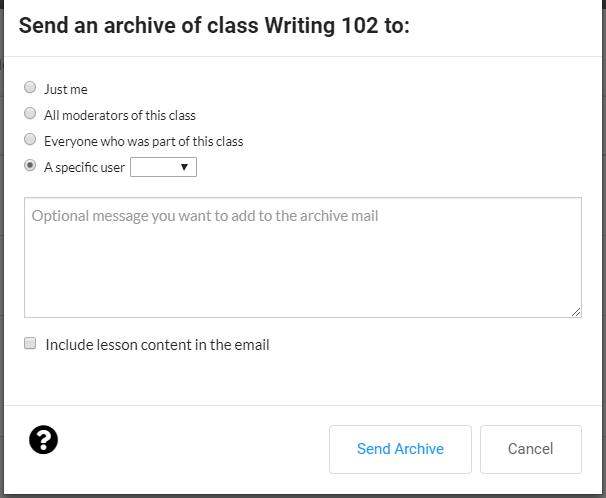 Even though the class is closed, you can email a copy of the class’s archived content to yourself or individual participants. You can find recently archived classes in your Classes tab, and all the classes that you have previously closed can be found under "'Archived Classes' of your organization administration area. Go to the 'Administer Organization' (cog icon in the top-right navigation). Choose 'Classes' from the top navigation, then "Archived Classes" from the left navigation. Click on the "Email Class Archive" button under the "Actions" column. 4. It will bring up a pop-up window that lets you send it to a specific user or to yourself. This is also where you would include an email message.